Gareth Morgan writes a post that’s, frankly, beneath him. He rants against those he calls “climate deniers”. Though he’s shown in the past he makes efforts to be informed, in this article he recklessly misrepresents the sceptical position. Well, that’s a charitable interpretation; it’s more likely that he is trying to marginalise the sceptics. It’s pathetically easy to show he’s wrong (give me a minute on that). The short-lived late-20th century warming halted 15-20 years ago. He must have heard about the pause and knows that these statements are false. For heaven’s sake: the IPCC tried unconvincingly to explain the pause in the Fifth Assessment Report. The Hockey Schtick lists 63 excuses given around the world to explain away the pause. A paper last year by Dr Ross McKitrick claims the pause had lasted 19 years at the surface and up to 26 years in the lower troposphere. Everyone agrees there is a pause. You cannot remain pig-headedly defiant of the evidence. The five major temperature records to April 2015. 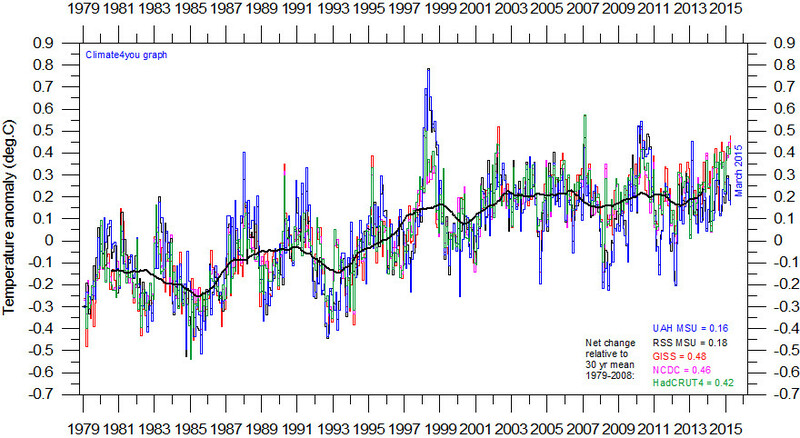 Since about 1995 the temperature, though varying, has shown little or no warming trend. The temperature trend shows no sign of “rising at a rate faster than any natural changes” or a “rapid upswing”—in other words, it hasn’t been warming. These are not my graphs, they are produced by international teams of scientists; Mr Morgan should retract his foolish statements. Click to enlarge. In this first blog we will strip back the rhetoric and take a dispassionate look at the facts of climate change. Then he spends over 40% of his article just moaning about the sceptics, or “deniers” as he prefers. He gives no evidence to support the allegation of global warming, much less does he help us believe that it’s caused by something we’re doing. Firstly to the small, vocal but shrill community of deniers. There are two common objections to the weight of evidence. The first is that either there’s not enough evidence yet. The second is that it’s fair game for any lightweight to blithely dismiss climate models because after all, they’re “just a model, not reality”. That’s it, that’s as deep as the deniers (what’s left of them) can manage to put up these days. Pathetic. First, 47.8% of respondents disagree or strongly disagree—they’re certain they cause climate change. Then, 27.6% strongly agree that they’re uncertain, and almost as many, 23.8%, can’t decide whether they’re uncertain or not. I think it’s clear that being unable to decide is the definition of uncertainty. That makes a total of 51.4% of us who are not convinced we’re causing climate change. The temperature is not going up; when do you predict that it will? The oceans are sometimes observed to be warming; as there is no mechanism for the air to significantly heat the ocean, do you agree that our emissions cannot be causing it? Vigorous debate is occurring among climate scientists on climate sensitivity (CS), or the amount of warming to be expected from a given level of airborne CO2; the IPCC strongly believes in high CS, while recent papers on the continuing lack of global warming report low CS; do you agree we should delay expensive policy responses until this vital factor is better understood? 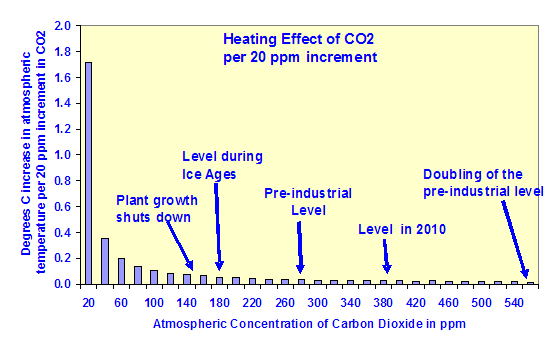 The warming response of airborne CO2 is logarithmic, meaning the more that is added, the less warming is caused by each new addition; do you agree this strongly diminishes the warming to be expected from our emissions in the future? The only predictions of dangerous temperatures come from climate models which reflect our deeply imperfect knowledge of the climate and consistently fail to match the past; do you agree we can safely ignore them until their performance has been shown to be skilful? If the “weight of evidence” for climate disaster really does “stack up with each passing year” why does Mr Morgan resort to such bitter deprecation of sceptics? When you’re trying to change a person’s mind, evidence works well. There’s nothing to say in the face of evidence, unless you can refute it, for which you need evidence. The only reason to abuse and revile the one who disagrees with you is that you have no evidence. But if you have no evidence, reviling him is still the worst tactic, since it immediately proves you have no evidence. Wake up, Gareth. Your million dollar inquiry into global warming has purchased a membership in the losing side. Not just you and not just comment threads Andy. Reminds me of the “pure evil” in Ghostbusters being let loose. It’s like someone pushed an “activate” button. That’s right — a sitting U.S. Senator is suggesting using RICO laws should be applied to global warming skeptics. Courts have been defining RICO down for some time and in ways that aren’t particularly helpful. In 1994, the Supreme Court ruled RICO statutes could be applied to pro-life activists on the grounds that interstate commerce can be affected even when the organization being targeted doesn’t have economic motives. Passed in 1970, the Racketeer Influenced and Corrupt Organizations Act (RICO) is a federal law designed to combat organized crime in the United States. It allows prosecution and civil penalties for racketeering activity performed as part of an ongoing criminal enterprise. This is a long way past hysterical nutcases in out-of-the-way internet comment threads making bizarre claims. This is a serious and blatant attempt by a politician to turn dissent into a criminal activity and define it as “organized crime”. And to prosecute dissenters as organized criminals undertaking a criminal enterprise. I think this is the notion that Kuni is promoting with his (rather irrational) “There are those who want to commit mass murder on a global scale with global warming” accusation. This mindset did not go away with the fall of the Berlin wall, it just sought out new streams of action for the same underlying objective. One of which is the very convenient man-made climate change school of thought. Naomi Orekses and Suzanne Goldenberg, seem to like the idea of having climate “deniers” arrested under RICO act for thought collusion. In June 2009, a public appeal was issued on an influential U.S. website [hotlink] asking: “At what point do we jail or execute global warming deniers.” The appeal appeared on Talking Points Memo, an often cited website that helps set the agenda for the political Left in the U.S.
After all the attention drawn to it by Climate Depot, the Talking Points Memo article was later pulled and the website published a retraction and apology, but the sentiment was stark and unequivocal and has significant company among climate fear promoters. Freedom of speech is out of the question with these people. Their mindset is: If you disagree with us, we want to kill you. Stalin’s actions meant the death of 66,000,000 people, that was your prospect if you dissented from his regime or did not conform. He has a post on why it is “worse than we thought”. This guy is actually trying to sell investment products to the public. Simply unbelievable rudeness and arrogance.